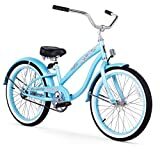 This 20-inch single-speed Bella Classic girl's cruiser bike from Firmstrong is ideal for both children just learning to ride as well as those who have graduated from training wheels. It features a 13-inch extended length steel frame, 20-inch wheels as well as front and rear fenders. The coaster brake stops by pedaling backwards, which is an easy and safe way for children to learn to ride. 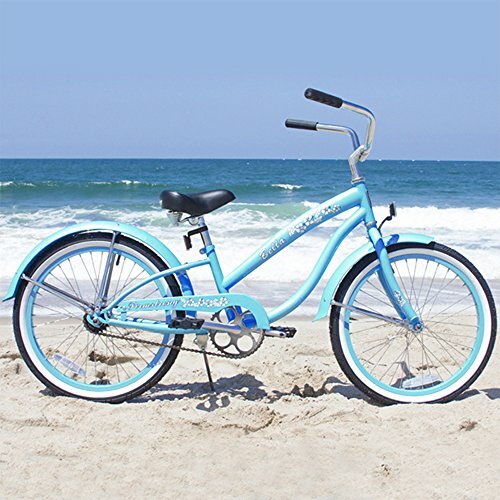 Elegantly sleek with an artful design of Hawaiian flowers on thick top tube, it's a great choice for many riding environments -- by the beach or anywhere else on a paved path. This bike is sized for young riders from 3'-2 to 4'-4"-inches tall. The bike is designed just like Firmstrong' s bikes for older riders with a classic, curvy cruiser design and a top bar that arches down to make it easier to step over and get on the bike. The 20" aluminum wheels feature wide white-wall tires that roll smooth and easy as well as cushion the bumps as you ride over them freely. The wide, oversized seat completes your comfort with dual springs for a soft ride. Both the seat and the handlebars can be adjusted to ensure maximum comfort. It also features a chain guard to protect pant cuffs and wide cruiser bike handlebars with synthetic leather grips. The bike is shipped 80 percent assembled. Firmstrong has been designing high quality, affordable bikes for over 10 years with a focus on blending style and functionality to create a fun, adventurous experience for riders -- not just a mode of transportation.